New Directions Publishing Corporation, 9780811215183, 176pp. January Marlow, a heroine with a Catholic outlook of the most unsentimental stripe, is one of three survivors out of twenty-nine souls when her plane crashes, blazing, on Robinson's island. Presumed dead for months, the three survivors must wait for the annual return of the pomegranate boat. Robinson, a determined loner, proves a fair if misanthropic host to his uninvited guests; he encourages January to keep a journal: as "an occupation for my mind, and I fancied that I might later dress it up for a novel. That was most peculiar, as things transpired, for I did not then anticipate how the journal would turn upon me, so that having survived the plane disaster, I should nearly meet my death through it." 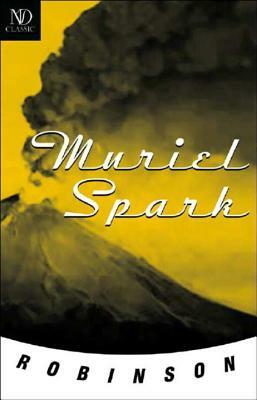 In Robinson, Muriel Spark's wonderful second novel, under the tropical glare and strange fogs of the tiny island, we find a volcano, a ping-pong playing cat, a dealer in occult as well as lucky charms, flying ants, sexual tension, a disappearance, blackmail, andperhapsmurder. Everything astounds, confounds, and convinces, frighteningly. "She is," as Charles Alva Hoyt once put it, "the Jane Austen of the Surrealists." Robinson, a unique and marvelous novel, is another display of the powers of "the most gifted and innovative British novelist" (The New York Times). In the work of Dame Murielin the last words of Robinson "immediately all things are possible.